Hey guys here’s another post from our collaboration which by the way is going really well. Thanks to all you wordpress family. So here goes about Self love from a personal experience. The trend focus on eyebrows has me thinking about my younger, innocent years. Ever since I can remember I had these healthy, thick eyebrows and my sister would mercilessly tease me by calling me “beast brows”. I think we never really notice these things early on but as soon as I became a teen, my sister’s teasing, calling me beast brows started getting to me. The “beast” bit was obviously an exaggeration on my sister’s part, they weren’t so bad but being continuously teased about something makes you start doubting yourself. So, when I was about 14 I went to the saloon and got them tweezed because I wanted to look “normal”. Anyway, as soon as I got them done I was so happy. No more beastly teasing. Boy, was I wrong, my sister found something else to tease me about and I realised that cycle was never going to end. After a few months of “weak brows” I realised it was the biggest mistake of my life. Though the new brows made me initially happy after a while they felt foreign on my face. The harder I tried to look normal the more prominent they seemed. To the point I couldn’t see the girl I used to be, couldn’t recognise myself in the mirror. Instead of me, this stranger stared back at me. There was always going to be something in the way of me being somebody’s idea of beautiful. Along the way I lost track of what I thought made me beautiful. This is how it begins, isn’t it? You see something as unimportant as your eyebrows and think maybe if I change them… then to match the new look you change something else, essentially changing the face/body you’ve known for years. Turning yourself into this unrecognisable carbon copy of somebody you admired on the TV or the magazines. I learned my lesson and decided never to let anyone dictate my life, my choices. Since then I’ve never changed anything about myself I’m not stick thin and I’m not healthy, I’m not fair but I’m not your problem either. In the Middle East, a fair complexion is considered pretty I guess because we all idolise uniqueness, to be different. Tan is common here, while my friends in the West keep trying to get tan. It’s only natural to want what’s pre-approved and stamped by the society. We’re programmed that way. My brow catastrophe is not such a horrible story I’m pretty sure people have been bullied with a lot worse but this is me trying to tell you that changing yourself even a little bit because of someone else is not going to make you happy. It will catch up with you eventually, and you will not recognise yourself. Society keeps trying you to alter your concept of beauty with words like symmetry, too curvy, fat, skinny, too dark, too pale. It’s never going to end. If you’re healthy, you’re fat and if you’re thin, you’re skinny. It’s not just something us ladies face, Men face the same issues. I have friends who are teased and called sissy or manly men for being the right amount of macho. If you try you might end up looking like a celebrity but that’s how people will see you then, as X or Ys lookalike. You will probably never be accepted anyway but at then end of the day the only opinion that matters is yours. Ask yourself this when you look in the mirror; Do I like what I see? Is this the person I want to be or the person they want me to be? This is the fourth Collaboration with a Purpose blog post. 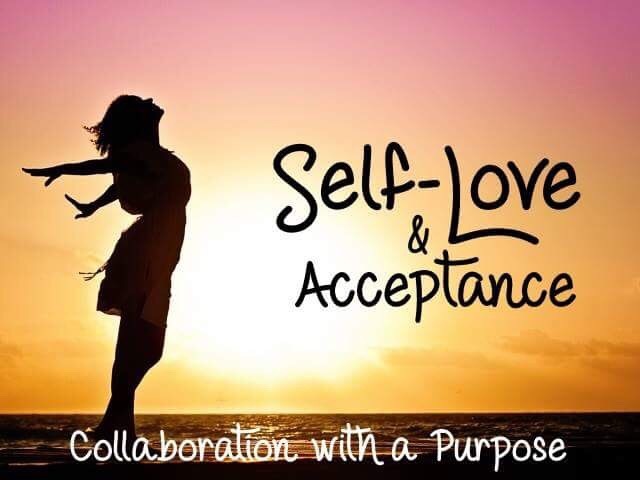 Guys, Please check out all of the amazing and inspiring posts on Self-love and Acceptance. You will definitely feel loved when you are done reading! I like to think that as long as I’m healthy, I should be happy, since many only dream of that, but I guess we all have insecurities. I think asking such questions is important! Great ideas! Exactly. If you look for flaws, you’ll end up finding them. And no I’m in Pakistan. What made you think that? Ohhh……great..Anyway..Don’t you feel that you are pretty??? Teasing puts down a person’s self belief and affects self love. Poor eyebrows! I love this, Manal! Your eyebrow example is so true! If it isn’t one thing it is something else that we can not like or be made fun of. We have to accept all of us and be okay with the features we were blessed with. I struggled with being half Puerto Rican and half Korean and feeling like I didn’t fit into either culture, but with time, I had to embrace who I was. Aaaaah! The advantage and disadvantage of having siblings. They have the power to uplift us and break us. They just won’t keep their mouths shut sometimes. But we still love them anyway as we have no choice. Good to know, you’ve decided not to let anyone dictate your life and the choices you make. Btw, I think there’s nothing wrong in your brows. You look amazing! Thanks for sharing this story! People who contantly force us to change our perception of beauty are perhaps people who don’t love themselves because if they did, they would be more worried about improving their skills and not questioning ideologies! I Loved reading your unique perception. Siblings! Ha ha. They really know how not to shut up when necessary. But then again, I like to see it as they show what’s out there in the world. If you can still love yourself despite their teasing, then you can probably handle anything else life throws. Awesome post, Manal. Very unique and moving. And girl, you SHOULD feel good about yourself all the time. Because despite what people say, there can never be another you. You’re so right, people will always find something that is wrong with your appearance. What’s sad is sometimes we believe the things they say. You have to love yourself as you are. Love your post. I’m one of the people that rely on the beauty of heart more than anything else. That’s greaaaaaaaattttttttt..,sweeeeeeeeeeeeeeet,and awesomeeeeeeee manal Ahmad. Nice post Manal……you are beautiful in your own way and that’s what you have to love about you……..but sadly we spent awful lot of times trying to put ourselves into that perfect shape as per others’ opinions……:)…….. Going to be mad. Great work. Best wishes for further stuffs. It’s a sheer coincidence that today itself I posted a write-up after a long time on a similar topic and happened to read your’s too. Good to know that many of us feel this way.All the best.